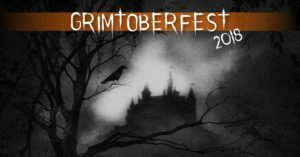 ﻿ Nihlos » Blog Archive » Grimtoberfest 2018 is here! This entry was posted on Wednesday, October 3rd, 2018 at 6:07 am	and is filed under Current Projects, Eye of the Lion. You can follow any responses to this entry through the RSS 2.0 feed. You can skip to the end and leave a response. Pinging is currently not allowed.